Call today to reserve your horse's Spa Day! Owner Carey Miller lives on premises and is a certified farrier (since 1986), a certified equine massage therapist (since 1997), received postural alignment specialist certification from The Egoscue University in 2006. Ms. Miller, president of Caper Lea, Inc., has her BA degree in Animal Behavior from Cornell University. She completed her certification at the Eastern School of Farriery under Danny Ward in 1986. Additionally, she has received a certificate in Equine Anatomy studies from the Zahourek Systems School, is certified by Equissage in equine sports massage therapy, and by Integrated Body Therapies in equine myofascial release. Ms. Miller has been practicing equine massage therapy since 1997. She has had a life-long passion for horses, dogs and wide-open spaces. She lives in Trappe with her horses, dogs, cats, chickens, and her ever-supportive husband, Peter. The stalls in the barn are 180 square feet, have overhead fans, plenty of ventilation, hay-grazers for slowed hay consumption, and all have great views to the pastures and other horses. 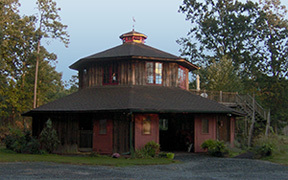 The barn was designed and built by Peter Zukoski.